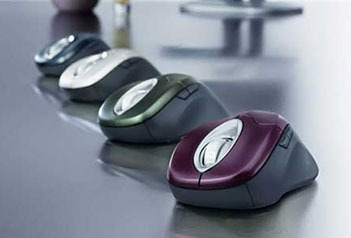 Just found this lovely picture of Microsoft Intellimouse Explorer 2.0 in blue, white, lime/green, mauve/lila in this review. But there is no way to find the white or the green (not the “night vision” model) in the web for sale. Was this just a product study ? They look really better than the sale models. So anyone got a clue what this picture was meant for ? This entry was posted on Thursday, May 25th, 2006 at 11:12 am	and is filed under reviews. You can follow any responses to this entry through the RSS 2.0 feed. You can leave a response, or trackback from your own site. Pictures and Code » Home » product not existent ?